LANSING (February 22, 2018)— State leadership and lawmakers came together this week to honor southwest Michigan leaders for their efforts to create jobs and develop talent in their communities. 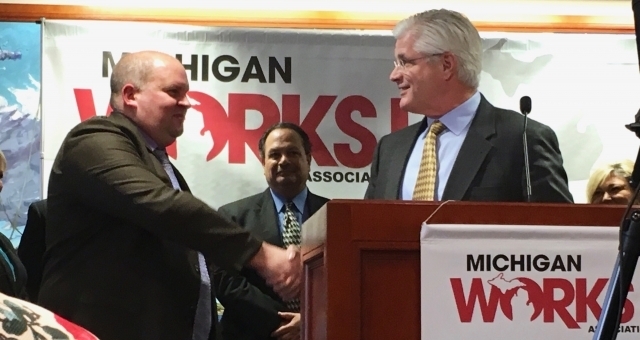 Legislators and talent development officials recognized Clemens Food Group, the City of Coldwater, Kellogg Community College, the Michigan Talent Investment Agency, local resident Rob Rzepka and Michigan Works! Southwest with 2018 Impact Awards. In 2014, when Clemens Food Group first announced their plan of expanding operations into Coldwater, they approached Michigan Works! Southwest and the State of Michigan for help in filling over 800 positions. Michigan Works! Southwest’s focus was to work with partners to meet the needs of Clemens by implementing customized strategies. Due to the size of this project, targeted to generate $310 million, Michigan Works! applied for and received a grant from the Michigan Talent Investment Agency to help fund a team to work with Clemens. Once the hiring process began, Michigan Works! helped facilitate over 75 career fairs and information sessions and assisted in interviewing candidates, onboarding new hires and tracking positions. During this time, Rob Rzepka visited Michigan Works! to seek support in finding a career, not just a job. Rob’s career coach saw an opportunity with Clemens as a match for his skill set and interests. Rob completed a series of interviews, ending with a face-to-face interview with the Clemens executive team in Pennsylvania. He was offered, and accepted, an opportunity to train for a supervisor position. Currently, Rob is employed as a superintendent for Clemens Food Group in Coldwater. “Clemens Food Group is a tremendous asset to our region. I commend Michigan Works! on spearheading this project, which will bring hundreds of jobs to Michigan,” said state Sen. Mike Shirkey (R-Clarklake). The Impact Awards, hosted by Michigan Works! Association, honor the finest achievements in workforce development statewide, from the creation of new jobs to the accomplishments of hardworking citizens. During the annual event, lawmakers present tributes to award winners, employers, workers, Michigan Works! Agencies, and partners, who share their stories and the role Michigan Works! played in their success. “I wish Clemens, Michigan Works! and Rob all the best, and look forward to hearing how their professional outcomes continue to flourish,” said State Representative Eric Leutheuser (R-Hillsdale). Find the nearest Michigan Works! American Job Center by visiting michiganworks.org/agencies/map or by calling (800) 285-WORKS (9675). Michigan Works! Association is a non-profit membership organization that provides services and support to Michigan’s talent eco-system. For over 30 years, the Association has been a go-to resource in federal, state and local workforce initiatives. The Association’s work ensures top-quality services and support for Michigan’s talent pipeline. For more information, please visit michiganworks.org.